Aside from the fact that my omelet-making skills would make the French cry, frittata trumps homemade omelets in my book in so many ways. You can make it ahead, which is pretty tricky to do with a regular, melty cheese-filled omelet. 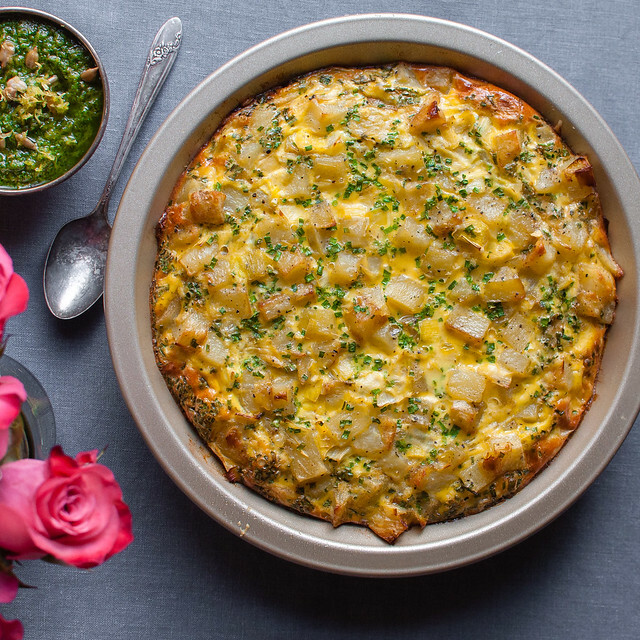 Frittata freezes well–something I would never attempt with an omelet. You make it for everyone all at once, and you get to enjoy a mimosa around the table while it bakes. 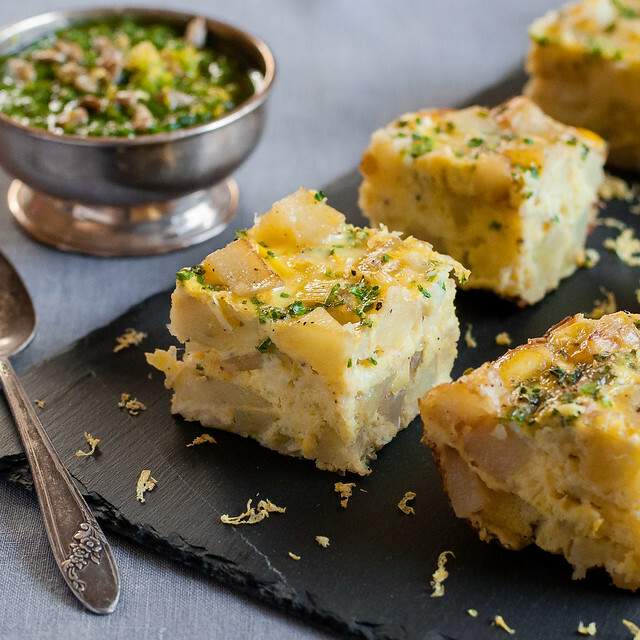 You can get away with serving it as an appetizer, which works especially well when you cut today’s potato leek frittata into cute little squares and top it with seasonal pesto. Finally, you don’t need a special pan to make it. As I proved on my Instagram earlier this week, everything is better when you make it in a pie plate, especially frittata. When I tasted the omelet that Steve ordered on our honeymoon in Austin, at Bouldin Creek Café, it took an already awesome find to a whole new level. Not only was this vegetarian restaurant quirky and friendly in the best way, they have some serious chops in the kitchen. I wanted so many times since to recreate that omelet, but then I remembered how ugly my omelets turn out, and frittata emerged as the solution. It just needed a little pop of freshness, and instead of the sour cream the restaurant served, I whipped up this vegan parsley pesto that I would normally frown upon. Pesto without cheese??? Count me as converted, though, because toasted sunflower seeds provide all the smoky, smooth flavor that you count on from parmesan in traditional pesto. The ingredient list for the frittata isn’t particularly seasonal (besides some extra tasty leeks maybe), but for some reason the whole thing, with its pastel yellow and bright green sauce, screams springtime to me. It’s just right for spring brunch, as you can easily double the recipe and even make it a week (or more) ahead, stored in the freezer. It also makes an extra exciting weekday breakfast, a theory I tested myself with the leftovers, and by the end of the week it was still delightful in every way, no omelet skills required. Gluten free and vegetarian. 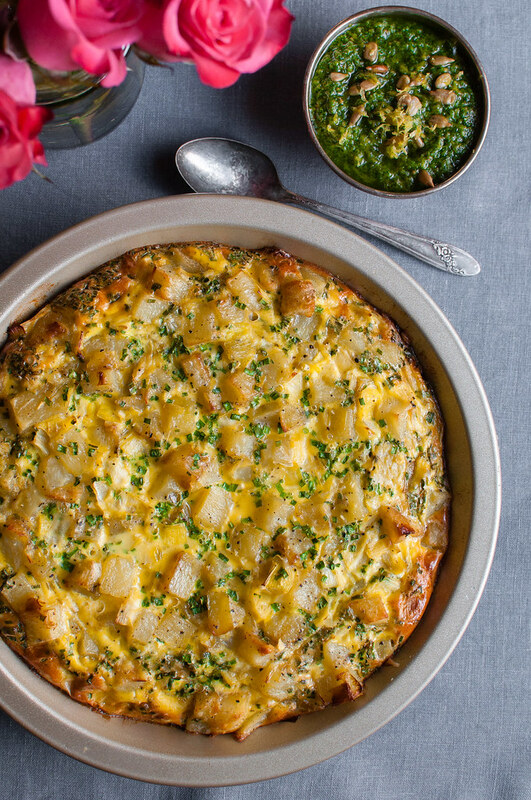 Inspired by the heavenly potato leek omelet at Bouldin Creek Café in Austin, Texas, this frittata allows a few simple ingredients to shine, and it's easy to make ahead. Dollop each piece with sunflower parsley pesto for a surprisingly smoky and bright bite. Preheat oven to 375 (F) and place rack in upper middle position. Heat 1 tablespoon each butter and olive oil in an 8 to 10 inch cast iron or non-stick skillet over medium heat. Add potatoes and cook until soft inside and light golden brown, about 20 minutes. Remove to a mixing bowl and season to taste with salt and pepper. Add the last tablespoon olive oil to the pan. Once hot, add leeks and cook until tender but not browned, reducing heat as necessary (about 7 minutes). Season with salt and pepper and add to bowl with the potatoes. Spray or lightly oil a pie plate and spread half the potato-leek mixture in the bottom. Top evenly with all the Gruyere, then a layer of the remaining vegetables. Whisk together the eggs, sour cream, garlic, fresh herbs, and a generous pinch of salt and pepper. Pour evenly over the pie pan, then gently shake the pan to work the eggs down into the dish. Bake about 35 minutes in the preheated oven until just set, golden around the edges, and slightly puffed. Cool slightly and serve warm or at room temperature with vegan parsley pesto (below). Combine parsley, sunflower seeds, and garlic in the food processor until finely chopped. With the processor running, drizzle in the olive oil until just blended. Just before serving, stir in lemon juice or vinegar, salt, and pepper to taste. Serve it however you like, but I like to cut the frittata into traditional wedges as an entrée, and cute finger food squares when serving it as a brunch appetizer or buffet item. 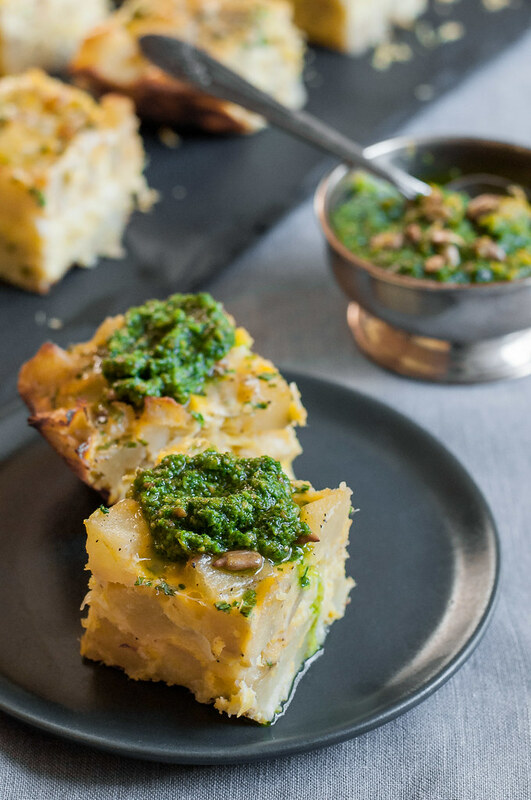 Top squares with pesto in advance so guests truly only need one hand to eat it. Both frittata and pesto keep well for a few days in the fridge. Reheat the frittata, covered, in a 250 degree oven, or simply allow it to come to room temp. The pesto will solidify a bit in the fridge, so allow it to also come to room temp (do not store at room temp).